Evening primrose oil benefits for skin are numerous. This oil is a great source of Linoleic Acid (LA) and Gamma Linoleic Acid (GLA). Linoleic Acid is a polyunsaturated fatty acid and is a part of the Omega 6 fatty acids. When our body has a deficit of Linoleic Acid it leads to dry hair, hair loss, and poor wound healing. Evening primrose contains a lot of this essential fatty acid that is crucial for a healthy looking skin. Fatty acids that evening primrose oil contains, help skin to look firm and tight. Evening primrose can also help calm the skin, it is also great for periods when your skin looks dull or pimply. Hormonal acne, which most commonly appears in adult women ages 20 to 40, is caused by fluctuations of estrogen and progesterone hormones. Evening primrose oil is known for treating hormonal imbalance in the body because it is is extremely rich in omega-6 fatty acids. According to Dr. Axe, omega-6 fatty acids play a key role in supporting hormonal function. This, in turn, helps reduce acne and breakouts on the face, because it tackles the root cause of hormonal acne, which is a hormonal imbalance. How to use evening primrose oil to treat acne? There two most common way you can do it. First of all, you can apply evening primrose oil topically on your skin. Apply 2-3 drops of the oil to your face every day just before going to bed. Evening primrose oil is quite thick and has a strong smell, that is why applying it in the morning can leat do an unpleasant shiny appearance of the skin. Our skin needs 27 days to fully regenerate and get rid of old dead cells, so you would at least need to wait those 27 days to see the results. In general, long-time usage of evening primrose oil for skin shows better results, and if you won’t get rid of acne completely, at least your pimples will start clearing up faster than usual. 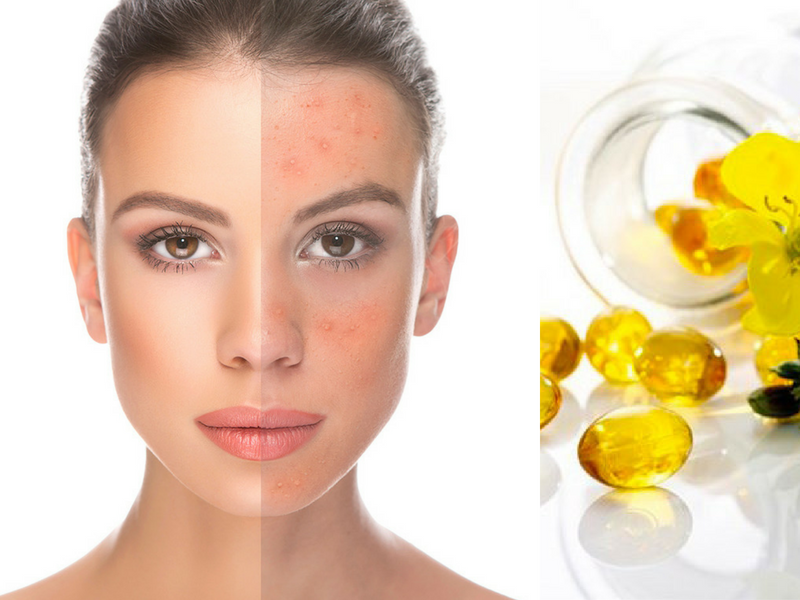 However, taking evening primrose oil in a form of supplements would have an even better effect on acne healing, as it helps to combat hormonal disbalance problem internally. You can increase the dosage of evening primrose oil for acne treatment up to 1300 mg per day. In this case, you might want to buy more potent capsules and you would only need one capsule per day. In some cases, the dose could be increased to 1-3 capsules of 1000mg each per day (no more than 3000mg). Reddit readers report major improvements in their fight against acne since they started to consume evening primrose oil topically and as a supplement. Besides evening primrose oil can also keep skin from becoming overly dry, which is a common side effect of certain acne medications. Psoriasis is an auto-immune disorder is a common skin condition that speeds up the life cycle of skin cells. It causes cells to build up rapidly on the surface of the skin. As a result, the skin might be covered with spots of irregular form, which may be red, white and peeling. Common symptoms of psoriasis, apart from the skin look, are dryness, itchiness, discomfort, and pain. Can evening primrose oil help with psoriasis? Scientific studies of this question lead to controversial results. One double-blind test of the effects of evening primrose oil in treating psoriasis could not find any significant improvement in the patients’ conditions. Another test showed that evening primrose oil in combination with fish oil does influence positively on patients` condition and helps to reduce psoriasis symptoms. Evening primrose oil is exceptionally useful in decreasing inflammation and excessive cell turnover. Thanks to the GLA, which can be found in high concentration in evening primrose oil, conditions like psoriasis whose cause and cure are unknown, can be relieved and healed. Evening primrose oil makes the skin soft, supplies it with essential nutrients and healthy fats, making your skin look youthful and plumped. Healthy fats are essential for a healthy looking skin. Epo is also known for its anti-inflammatory properties including the ability to reduce swelling, redness, itching, and rashes. To support the glowing appearance of your skin, take evening primrose oil orally (start with one 500mg capsule twice a day). You can also apply EPO topically in a form of facial oil, or add some drops of liquid EPO to your night cream. Evening primrose oil is known to lighten the skin and reduce dark spots. This feature is among one of the most powerful evening primrose oil benefits for skin. A study reveals, that evening primrose oil reduces melanin production and has a soothing and restoring effect on pigment spots caused by exposure to UVB radiation. Take EPO supplements internally this oil twice a day (start with 500ml capsules). But the most effective application is topical: rub evening primrose oil to the areas affected by hyperpigmentation. You can use pure liquid evening primrose oil or combine equal amounts of primrose oil with argan oil and add a few drops of lemon juice to the mixture. Apply this on the affected areas every night to treat uneven skin tone and unwanted dark spots. Evening primrose oil is also effective in reducing hyperpigmentation when it is caused by hormonal imbalance. To reduce the appearance of hyperpigmentation takes 3000mg of evening primrose oil daily. This will help affected skin cells to heal. Atopic dermatitis (eczema) is a skin condition that is characterized by dryness, itchiness, swelling, and crusted, thickened plaques of skin. Can evening primrose oil help with eczema? There is some scientific evidence supporting the idea that evening primrose oil is a great natural remedy for eczema. One of the studies showed some improvements in eczema condition (through lowering the inflammation), but the effect appeared only after 12 weeks of taking EPO. Another research has shown thought, that there is not a lot of difference in the treatment of eczema when this oil is compared to a placebo. Use evening primrose oil topically or in the form of capsules at least for 12 weeks to improve eczema symptoms. Evening primrose oil can be a great addition to your drugstore moisturizer or can fully substitute bought creams. It smells pleasant, has a low comedogenic rating so it won´t clog pores and cause breakouts. EPO nourishes your skin with essential fatty acids. The oil leaves the skin feeling supple and youthful. For a light face moisturizing lotion, mix even parts of a carrier oil (e.g. jojoba or grapeseed oil), moisturizing oil (evening primrose oil or tamanu oil) and finish it off with 6 drops of essential oils such as geranium essential oil or rose essential oil for extra skin-enhancing benefits. Evening primrose oil is famous for its anti-inflammatory properties help reduce inflammation, swelling, and soreness on the skin. This helps to reduce redness, itching, rashes which may also be one of the side effects of eczema, psoriasis or other skin conditions. If you want to get rid of dull and uneven skin appearance naturally, evening primrose oil is one remedy you definitely should consider. Unlike other oils such as coconut oil, evening primrose oil does not have a reputation of tanning skin or darkening the skin. Blend 2 tbsp of evening primrose oil with 2 tbsp of argan oil. Now add 8 drops of lemon oil, 8 drops of lavender oil and 5 drops of carrot seed oil. Combine together in a 4 oz amber glass dropper bottle. Apply on your skin every night to see skin brightening effect in a few weeks. One of the main benefits of evening primrose oil for skin is an anti-aging benefit. This oil is often used by the cosmetic industry as the main ingredient in anti-aging cosmetics for mature skin. It is explained by the fact that EPO has ultra-moisturizing qualities that can help keep the skin supple, smooth and soft. It also supplies our skin with vitamins and other nutrients that help maintain the normal function of skin to prevent premature aging. Evening primrose oil also has strong antioxidant properties that help prevent free radical damage on the skin. Applied topically, EPO enhances the epidermal barrier, which in turn helps prevent the formation of wrinkles and fine lines. Consider adding evening primrose oil to your moisturizer.